Ricky Gutierrez, Founder and CEO of the 1771 Group of Restaurants, envisioned a place where people could come together for memorable dining. When Chateau 1771 first opened its doors in 1771 Adriatico Street in 1988, it convened discerning gourmands who wined and dined amidst the backdrop of the busy city life. For more than three decades, Chateau 1771 has moved with the times, situating at the current center of business and lifestyle—from its original location in Malate, to Ortigas, to the bustling Makati City, and now at the up-and-coming Bonifacio Global City in Taguig. They may have moved to a different location, but Chateau’s food remained exquisitely mouthwatering, hearty, and auspicious. Executive Chef Vicky Pacheco showcases the “No Borders Cuisine” concept superbly, highlighting outstanding innovations on French, Swiss, to Italian favorites. Her culinary imaginations constantly astonish diners with wonderful twists on European favorites. Heighten your perception of a good meal. Start with the Butter-Baked Oysters. These fresh Aklan oysters are baked with butter flavored Worcestershire sauce, garlic and parsley, then topped with bacon bits. Opt for something light with the Goat’s Cheese and Grilled Apple Salad. Enjoy chèvre cheese, bacon, and grilled apples drizzled with Pommery mustard dressing over mixed greens. Also try the restaurant’s two crowd favorite dishes. Potence is grilled beef tenderloin hung on metal gallows then flambéed with brandy. The serving itself is a performance to behold! On the other hand, the Butterflied Queen Prawns is nicely plated stuffed prawns cooked with cream, mushrooms, squash and raclette cheese served with risotto. Cap off the meal with their famous Coffee Pie. A must eat, it’s chocolate cashew crust with coffee filling, topped with cream cheese & toffee sauce. Relish on the new dishes that have been carefully concocted to appease today’s discerning palates. Bring a bit of nostalgia and sample old favorites from when the restaurant began. Whatever your age is, appreciate the fine food that strongly defined this restaurant’s legacy. 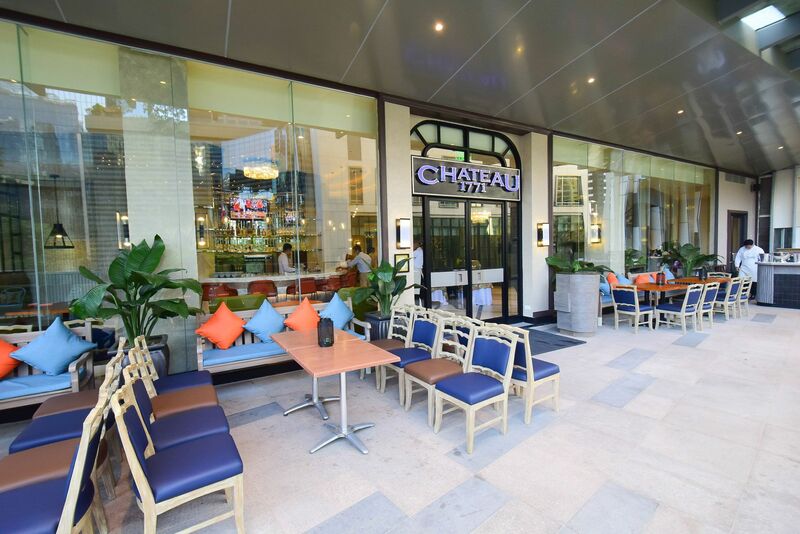 Chateau 1771 is located at 2/F One Bonifacio High Street, 5th Avenue corner 28th St, BGC, Taguig. For reservations or more information, contact 0917-8626467 or visit the website www.chateau1771.com.ph.